The guitar John Lennon used to write several Beatle hits on has been lost for over 40 years but now is found. Hear the remarkable story of where it has been and the man who has been a good steward of it even though he didn't know it was Lennon's guitar until recently. "I played the guitar for 45 years and then found out it was Lennon's". Most guitar players and collectors alike have dreamt of one day finding that rare one-of-a-kind vintage guitar at a pawn shop, yard sale or small-town music store. For John McCaw of San Diego, California, the dream actually happened in 1969. But he didn’t realize his good fortune until late last year. For 46 years, McCaw played, cherished and cared for a truly magnificent 1962 Gibson J-160E with a Sunburst finish. The guitar always seemed special to him, but he never understood why. For most of those 46 years the guitar hung on a wall inside his home, surviving two adventurous sons, six rambunctious cousins, eight dogs, and scores of friends and family gatherings at “McCaw Central” in San Diego. No one ever had any inclination whatsoever of the guitar’s history or provenance, and never in his wildest dreams did McCaw ever imagine just how valuable – and special – this Gibson J-160E truly was. The guitar’s existence was announced to the world this past June by Julien’s Auctions in Beverly Hills, who will offer the guitar during its Icons & Idols Rock N Roll auction on Nov. 6-7. The estimated price range is $600,000 to $800,000, though some experts believe it could fetch well over $1 million, which could make it the new record holder as the most expensive guitar ever sold at auction. McCaw has been hounded for interviews ever since Julien’s press release hit the newswires. But other than one interview with a local San Diego television station, McCaw has remained silent. Collectible Guitar | Then and Now magazine is honored to offer McCaw’s first in-depth interview regarding this legendary guitar in its July/August issue, which is now available through the magazine’s web site at http://www.collectibleguitar.com. 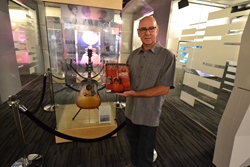 You can also buy the magazine at all Guitar Center retail store locations throughout the USA. In this exclusive story, written by longtime journalist and owner of Nashville’s Blues Vintage Guitar shop, Gabriel J. Hernandez, McCaw reveals the complete story behind the guitar and how he discovered it was Lennon’s long lost J-160E. Additionally, Hernandez’s in-depth investigative reporting reveals the true story behind the guitar’s mysterious disappearance, and its journey from Liverpool to San Diego. Others who have played it echo the same sentiments. “I have been absolutely blown away by this guitar. It’s really freaked me out,” said Andy Babiuk, owner of Fab Gear in Rochester, New York, and author of the critically acclaimed book Beatles Gear-All The Fab Four’s Instruments From Stage To Studio. “All I can tell you is that I’ve played guitars owned and played by Keith Richards, Bob Dylan, and many, many others. But this one … this one sent a chill up my spine the second I touched it, and that in itself is pretty amazing,” Babiuk said. For more information contact Gabriel J. Hernandez, owner of Blues Vintage Guitars, Inc. (bluesvintageguitar(at)att(dot)net) 615-613-1389, or Bruce Adolph - Publisher Collectible Guitar magazine (bruce(at)collectibleguitar(dot)com) 253-445-1973.